The garden is so tired, yet the summer is not done with us, and so it attempts growth. 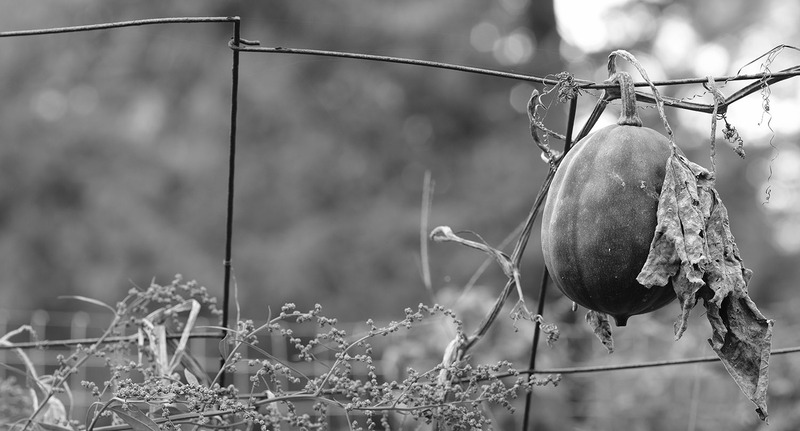 A green pumpkin hangs tenuously onto the fence, a withered vine feigns support. I have no idea what it keeps it alive. A tomato plant blooms, as does a pumpkin vine far from its original planting. Bees buzz, searching for autumn pollen. They do not know that the harvest has past. Their efforts are ceremonial, I suspect. The yellow cherry tomatoes that, during August and September, burst before they were ripe, hang whole and deliciously on scrawny vines that droop over the wire fence. Blossoms of the garden flower mixture, 60 cents at Buck’s Hardware, press against the wires, faces gaunt and hopeful, like prisoners of war awaiting liberators. Perhaps the kitchen scissors will give them their freedom, if I can find something to hold their stems. The fence goes back to April, a wall to protect the plot from the raccoons, ground hogs and rabbits that ravaged gardens of prior years. The old gate fell apart several weeks ago and I’ve not been of a mind to fix it. The garden is like the final act of the play, when the ticket taker retires to the back room for his Four Roses, and the passersby are free to wander in and take their pick of the entertainment, to catch the closing scene. As far as I can tell, not one critter has bothered, save the brown snake I disturbed one day and sent him on his way. All 12 inches of him turned on me, opened wide his venom-less mouth and went on his way, and I on mine. I’ve not seen him since, yet I watch for him. I have learned to always watch for the snakes. More threatening are the acorns. The mast is heavy this year and blankets the ground like a marble-factory truck overturned on the Interstate. The nuts are massive; they smart when they fall on my noggin and sound like gunshots when they hit the metal roofs of the garage and house. They ping and rattle down the incline six feet above my office ceiling and clog the gutters. Families of wild turkey wander in from the forest and feast on the bounty in the driveway, where my Scion’s tires accomplished released the meat. There are white-tailed deer, as well, and I suspect they claimed one of the four golden delicious apples the adolescent tree bore this year. This morning the breeze is warm and leaves green, I could mistake it for summer, but it is October, and a third of a way through it, at that. Uneasiness is in the air, and the heavy mast and white tips of my fingers, afflicted with Raynauld’s Syndrome, tell me a cold winter is coming. There will be logs to cut, split and stack, leaves to rake and yard items to put away. That’s the outside work; inside myriad projects beg completion—two books to write, edit, design and publish, video projects and freelance work. I feel like that old garden. I am hanging on to the past life of the workaday world, but my hands, the carpet of acorns and fence of dying vines tell me that world is past. I was retired in a flash, but the spots of that flash still cloud my vision and perspective. A bit of summer fans the hope that someday I will return to full-time work, but I know those hopes hang by withered vines; come the first frost, the gourd will drop to white-crusted earth with a thud that will wake nothing, not even the snakes. If plants have feelings, I wonder if they will sense betrayal when I rip them from the October soil, drop their bones into the yellow wheelbarrow and add them to the compost pile? Their fruit harvested, their work done, their bodies wracked with the pain of October, devalued, discarded … “We grew up together! You! My best friend!” Will that be their lament, as it was mine? Or perhaps, like the snakes that I fear so much, the plants don’t feel regret, pain or shame. They just slither about their kingdoms, hissing and going to and fro, seeking who they will deceive next. If so, I elect to feel their pain. I will feel the pain of October and beyond, to the grave. This much I have learned, pain exists that we might understand the heart of the gardener. We handle it better as we age, and a good thing, too, for there is much sadness and pain in this garden far removed from Eden.